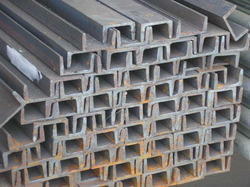 We are the leading exporter of Steel C channel which is available in the form if right angle ‘C’ sections. This range of channels is offered in various sizes, shapes and specifications which exactly suit the users’ requirements specifications. Our steel channels are extensively used for different structural applications along with the beams for support and guide. Further, these channels also find usage in both automotive and heavy machinery industries. Looking for Steel Channels ?